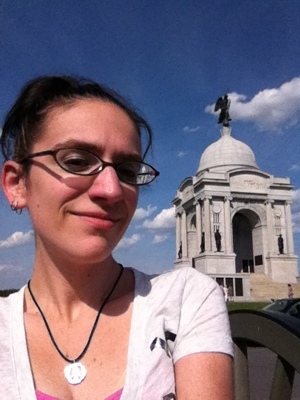 I’m in Gettysburg in June. That never happens. I never come to Gettysburg in the summer time. It’s touristy. There’s ghost tours running around nonstop. You stick to the bathroom floors. Lines of traffic are long. The wait for a parking spot at Little Round Top is longer. Blah, it’s just frustrating. And yet, here I am! Taking photos of myself! Wildlife! 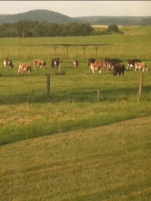 Okay cows. But still. Coincidentally (read: totally not coincidentally) one of my current works in progress takes place during the Civil War. So, in a way, this is research. I find Gettysburg insanely inspiring. The tragedy of what happened here, the lives that were lost; it’s just overwhelming. Take for example, the most haunting monument, in my opinion. It’s near the copse of trees, the Third Day’s battle. It’s just a rectangular monument that you might over look, with a scene of artillery carved on the side. Basically, it’s marking the spot where double canister was shot at advancing troops from twenty yards away. Twenty yards. Canister shot is a little canister of metal balls. When you fire canister out of an artillery piece, you basically turn the piece into an enormous shot gun. Double canister is two canisters shot out at the same time. If you get hit with double canister from twenty yards, you cease to exist. It’s the proverbial pink mist: you’re just gone. Your name is added to the “missing” roster because there’s nothing left of you to identify as you. That monument is like ice cold water in my veins. It haunts me, even after we leave town. But artillery! 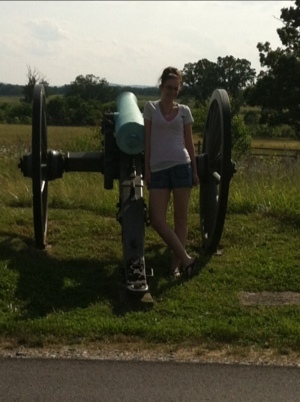 Artillery is what brings me to Gettysburg in June! Tomorrow, The Hubs will be with the Baltimore Light Artillery at Dunker Church in Antietam. They’ll be live firing, but powder only. No rounds. As for me, I’ll be dolled up in my finest 19th century regalia, just standing around entertaining the baby and seeing how much I can slouch in a corset. At least, I’ll be doing all that for twenty minutes. It’s going to be almost 90 tomorrow. So, if you’re in the area and feel so inclined, stop in and see the guys. The BLA puts on an amazing show. And, really, the feeling of the percussion coming from the barrel of an 1857 light gun howitzer is incredible. Previous PostI’m currently en route to fun. Next PostAin’t no party like an Antietam party,’cuz the Antietam party don’t stop!